AHRI-Certified. Connect up to 8 indoor units. The CX34 obtains it’s ultra high efficiency using existing technologies in a new way. For example, we use a DC Inverter compressor and a DC Inverter water pump (both are variable speed) controlled together with a DC inverter fan motor to achieve the best possible balance of water flow rate, compressor speed, and energy use (364 watts to 2360 watts at 230 volts). A special control algorithm looks at the temperature delta between the entering and exiting water temperatures of the chiller, and also compares the exiting water temperature to the system settings. The controller constantly adjusts the pump and compressor speeds independently of each other to maintain the needed capacity at the lowest possible power draw, usually avoiding the need for a buffer tank. There is not a more efficient air source heat pump chiller made anywhere by anyone. The CX34 system capacity is fully dynamic and can operate between 25% and 100% of its rated capacity, as needed, and matches its actual capacity to the instantaneous heating or cooling load in real time. This means the system is always the right size for changing conditions and is never oversized and avoids the on/off cycling of traditional systems. Every trick in the book and then some were used to create the Chiltrix heat pump chiller. This is the AHRI-Certified small heat pump unit of the future that is very easy to install and eliminates all lineset length issues. Cooling or heating is transported via simple water/glycol lines. The outdoor unit is completely self-contained. Just add power and connect the water lines. The indoor units are also very simple to install, just add power, connect the water lines, and connect a condensation drain line. The CXI series DC-Inverter fan coil units are the quietest fan coil units on the market. 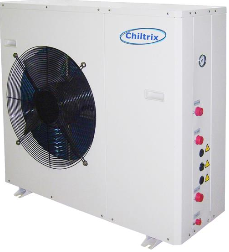 Chiltrix didn't stop at creating the most efficient heat pump chiller on the market. The components used to build the chillers are sourced from the world’s top manufacturers and include heat exchangers from Sweden, German pumps, American valves, electronics from Japan, controls from USA, and an inverter variable speed compressor from Mitsubishi. No corner has been cut when it comes to making sure that the parts and materials used to manufacture the CX34 are the best available. This chiller is designed for performance to deliver the lowest kW usage per BTU of any chiller heat pump available, and to perform this task for a 20+ year service life. 5-year Mitsubishi Inverter compressor warranty and 2-years on all other parts. Assembled in China. All replacement parts are housed in the USA. Anti-Corrosion technology is used on all outdoor units, protects against salt air in coastal environments. HEATING: The CX34 is well above average with up to 392% (COP 3.92) heating efficiency. Provides heating down to -4°F. OPTIONAL: CXSE free cooling module. When outdoor temperatures drop below 38°F, the CX34 glycol-water loop is automatically extended through a special water-to-air heat exchanger to harvest outdoor cold ambient conditions to pre-cool the glycol-water loop so that the CX34 variable speed compressor can drop to a very slow speed and consume less power. This can save about 50% off of it's already low power consumption without lowering capacity. At 28°F and below, the CX34 chiller with Free Cooling SE add-on will turn off the compressor entirely and still be able to maintain its rated cooling capacity using only the variable speed pump and fan motors. At this point, the CX34 achieves a COP of of >41 and EER of >141.